As promised, my review of Teaching Textbooks math — with big thanks to Kathryn, our resident expert, for her assistance in making sure I covered all the important points in this review! Teaching Textbooks is a full-year math curriculum that includes a consumable workbook, an answer booklet, and four CDs with step-by-step audiovisual instruction — plus a digital gradebook that instantly grades answers and calculates scores for each assignment. 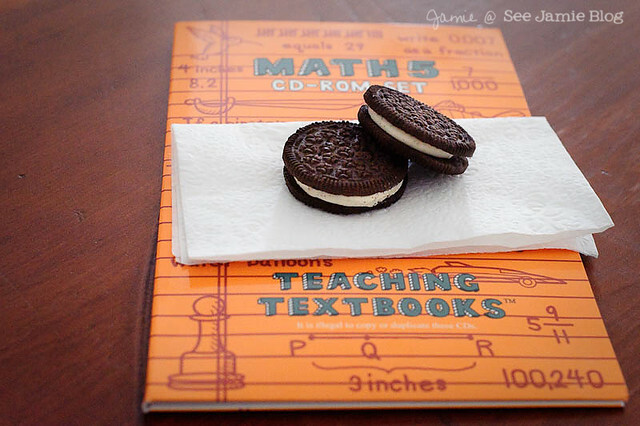 Teaching Textbooks helped alleviate math stress. First, since I always find reviews most helpful when I know where the reviewer is coming from, let me tell you a bit about us. I have home educated Kathryn since kindergarten, and we have used several of the math curricula I most often hear about: Saxon (1st and 2nd grades), Horizons (3rd and 4th grades), and Singapore (kindergarten, and beginning of 5th grade). They have all had their good and bad points. Somewhere along the way, though certainly not entirely because of curriculum we were or weren’t using, Kathryn began to hate math. Our homeschool days became stressful because of all the difficulties surrounding our math lessons. Clearly, I couldn’t just do away with math entirely, but we had to have something significantly different. She had become frustrated, and began to feel as though math was hard and she was bad at it — which was far from the truth. I hesitated in trying Teaching Textbooks because of the cost. I don’t mind paying for a good curriculum that really works, but not for one we’d briefly use and then set aside. Finally, I took the plunge, deciding that even if it only succeeded in getting us over this difficult math-malevolent hump, it would be worth every penny. Before starting this program, we took a couple of weeks off from math so we could have a fresh start. I talked it up favorably, as I often do with any new thing we’ll be trying. Kathryn enjoys playing educational games on the computer, so I told her that in many ways, this would be like that. Kathryn puts in the current Teaching Textbooks CD into the laptop. She clicks the desktop icon to open the program, which we easily installed before the first lesson. Once the program opens, she logs in, then chooses the lesson she is to do. She can also view her gradebook at any time, and usually does so at the end of her lesson. The gradebook shows the score of each lesson, and any problems missed. Teaching Textbooks comes with a workbook, but we have not used that at all. She keeps a piece of scrap paper nearby to work out problems she can’t do in her head. The workbook is good to have for reference purposes, and some families might use it often. Each lesson is taught orally, along with animation demonstrating what is being taught. (You can view a sample lesson on the TT site.) The narrator has a pleasant voice, and every time the student enters a correct answer, the narrator offers some positive encouragement, such as Great job; You got it; or Awesome! Once the lesson has been explained, there are a few practice problems before the “real” assignment begins. Some of the questions in each lesson are true/false; some are multiple choice; some are fill-in-the-blank. I’m not sure what options there are for older kids in the upper-level programs, but this level allows the student to choose a “buddy” for each lesson. These buddies show up in the top left-hand corner of the screen, and change slightly as the child answers each question correctly. For instance, a robot is built a little at a time, until it’s complete and a new one starts. Same with paper airplanes. Or a kitten changes outfits and adds accessories, or a mouse climbs higher to reach a piece of cheese. The buddies can even be changed mid-lesson. They also offer occasional hints throughout the lesson. It’s fun, and if I’m not close by, Kathryn calls me over to see what the buddy is doing. In preparing to write this review, I asked Kathryn for her input. As a homeschooling mom, I can give my opinion about it, but I think the student’s opinion is just as important! She told me her favorite thing about Teaching Textbooks is the buddies; her least favorite thing is the T/F questions because they can be tricky. When compared to the other math curricula we’ve used, I asked if she likes this one better. When she said yes, I asked if it’s just a little better, or a lot; she enthusiastically said it’s a LOT better! From my perspective, the lessons are easy. No preparation on my part is required, and if I follow along with the lesson, I can easily clarify any questions Kathryn has — which are infrequent. It even does all the grading for me. In the beginning, she was very frustrated that she couldn’t go back to change an incorrect answer (except with fill-in-the-blanks, where the student gets two chances); she has perfectionist tendencies, and having a “wrong answer” on the grade book upset her. But I used that as a teaching opportunity in itself, and pointed out that a “wrong” answer is just a tool to show that we might need a little more practice on that type of problem. Once we worked past that, I’ve heard no complaining, and that is a DRASTIC change from what math time had become before starting Teaching Textbooks. Besides the improvement in our lessons, Kathryn’s natural enjoyment of math has returned, too. She doesn’t love every aspect of math, but she has always astounded me with the math she can do mentally (since I have to write down everything), in pointing out things like math problems on the clock (for instance, 4:28 is a math problem because 4 multiplied by 2 is 8). She ponders things like what pi really is, and where infinity ends, and how far you could count if you just kept counting. She is a math-minded child, which is why I knew there was something seriously out of whack when she started disliking it. Is this the perfect math program? No; I don’t believe there is one. And of course, we must keep in mind the individual learning style of her child, as well as many other factors. I don’t know how long we’ll keep using Teaching Textbooks, but it has proved itself invaluable in our home this year. More questions? Kathryn and I will do our best to answer them in the comments! I’m new to your blog and wanted to pop over from reader and tell you that I appreciated your review. I’ve seen this program around and have been curious. I’m going to take a closer look at a convention coming up in a couple months- math isn’t dd’s strong suit and therefore is an area we are constantly tweaking for better teaching, better learning, etc. So thank you for this- it was very helpful! I’m glad to read your review! I’m considering TT for pre-algebra/algebra, so your review is helpful. Tell Kathryn thanks! The review you have posted here is really helpful…We love this kind of textbooks! Sounds very much like our story! I’ve heard that about it being a year behind Saxon, too, but if my child learns to like math and master the concepts, I don’t mind!!! And I’ve also read that kids doing TT do score well on standardized tests. Thanks for a great review, and please pass my thanks to Kathryn, too! I appreciate the heads up about changing answers, because my little man would be the same way. I am at a point where I’m trying to decide what to start him in math, so this has been helpful. Think I may have to go see a demo. Thanks! Nice review! We love TT, too. And Kathryn’s papers look like Sprite’s! Makes me crazy — diagonal on the paper, random,not numbered, etc. 🙁 Does it bother you? Jimmie, your review was one of the final deciding factors for us trying this curriculum! And yes, the chicken-scratchy paper drives me a little bit bananas! We switched to TT this year too, and I have been amazed at the difference! M (roughly the same age as your daughter) likes it so much that we have decided if homeschool budget gets tighter, this is the one thing we will make sure to keep. She does her math willingly and often with enthusiasm! She also voluntarily discusses the new concepts with her grandfather, a retired math teacher, much to his delight. Eddie, Isn’t great to see enthusiasm come back?? Lisa, I feel your pain! I have a 17 year old that’s the same way. This year she is in public school and struggling through math there, but I would’ve tried TT with her this year if she was at home. Next year, she might be homeschooling again, and I haven’t decided the best approach for math with her yet. I am concerned that my son who is finishing the 4th grade tt will be ready for 5 th grade standard math level. Any thoughts? Martha, I don’t really know a definite answer to that, but I have heard that TT kids tend to do well on standardized tests, which would indicate that they’d be approximately on whatever “grade level” is. Of course, if you’re talking about switching curriculum, I’d recommend checking into the scope & sequence, because pretty much every curriculum varies, and he might be ahead in some areas but behind in others — no matter what curriculum you use. That even varies from public school district to public school district! Kerrin, I’ll keep an ear out! Maybe someone in your Classical Conversations group would want to buy them! My daughter hated Saxon, too. I have four kids I am homeschooling and we are thinking that at least a couple of our kids would benefit from this program next year. This year we are using Horizons, and while I love the workbooks, I don’t really care for the lessons and I don’t have as much time as I need to teach everyone. 🙂 Thanks for your review! Thank you for this review. I have been looking at TT for my 10 year old daughter. I am still undecided but reading your review and the comments has given me some points to consider. 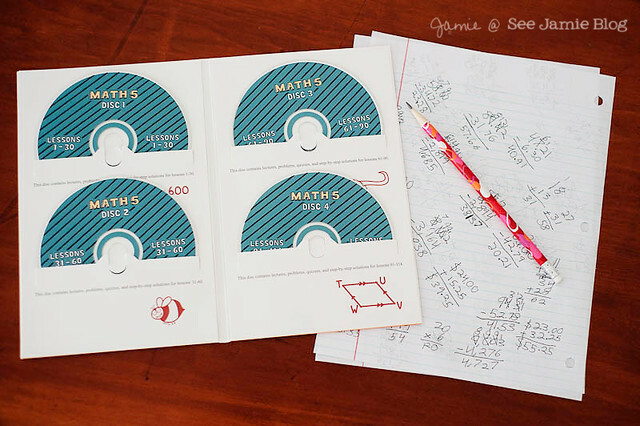 We have used TT for upper level math and it makes math a breeze even for this math-oriented mom. I have two different kinds of learners and they both enjoy TT. Mr. B is starting TT Pre-Calculus this term and it is going great. One point about the cost…you gain most of it back on reselling the package (except for the text of course). This is a nice review. Thank you for sharing this. This looks good for me. Another great math resource is Khan Academy. I do home teaching for the local school district and use this site a lot…particularly for math (although they have some other great stuff available). It provides a video tutorial and then practice questions. Kids can get hints, and it recommends other videos (tutorials or extension) based on how well the student does on the practice questions. And it’s FREE! A great addition to the home teaching arsenal. khanacademy.org. Yes, I’ve heard great things about Khan Academy, though we haven’t tried it ourselves. Thanks for the review! We have always used Horizons and Carson is not a huge math fan and I was thinking of using Teaching Textbooks in the fall. Your review is very encouraging! Oh, I also think I first heard about pin dolls on your blog. The kids and I made some the other day, they were so much fun! we are using TT for the first time this year for 4th and 5th grades and we love it! We have used saxon in the past and while I felt that was a good program it was done with MUCH complaining 😀 The boys enjoy TT and it takes them both 20 min tops to finish their math each day. We will be using it again next year. My K son is doing horizons but I plan to switch to TT in 3 for him too. We use Winter promise and sonlight for our other subjects. Good review Jamie. I tweeted and pinned it. I have used Teaching Textbooks for both my kids. I am curious if anyone can give feedback on how high school students who have used TT have done on state tests. The highest I’ve gone so far with TT is thru 6th grade, but she completely rocked her standardized testing this year. what about teachingtextbooks for kindergarten? where. do i start?! They don’t make it for that age range but K math doesn’t need much structured math. Don’t overthink it. We used Singapore math in the K and 1st grade years. I have a math-time crier too, I mean, more moaning and groaning, but I’m looking into this on for sure.